Don’t let the cold weather keep you inside. 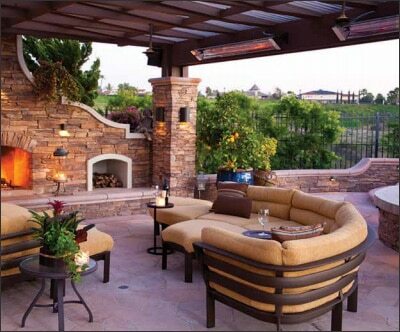 Enjoy your outdoor space all year long with energy-efficient, easy-to-use, extra cozy Infratech heaters! Infratech has been the industry leader in electric infrared heating for decades, and for good reason. Their heaters are over 90% energy efficient and operate for just pennies per hour. They emit a radiant, odorless warmth that won’t blow away in windy conditions or obstruct your view. We love Infratech for their exquisite designs and extensive selection of heater models and control options. Single Element Heater: Infratech’s W-Series heaters are ideal for most basic installations. They come in a variety of sizes and range from 1,500 to 4,000 watts. Depending on the size of your home or business, you may need to use multiple heaters for optimum comfort. These low profile heaters can be used both indoors and outdoors, and they feature minimal clearing requirements, recessed mounting options, and a clean, streamlined look. Dual Element Heaters: Infratech’s WD-Series heaters produce more concentrated heat and can be mounted up to 14 feet high. If your space has higher mounting requirements or needs intense, directional heat, dual element heaters are your best bet. They’re available in a variety of sizes and come in 3,000, 4,000, 5,000 and 6,000 watt models. Slimline Single-Element Heaters: Infratech’s SL-Series heaters are sleek, modern, and virtually disappear into their surrounding decor. They can withstand years of outdoor use. Slimline heaters are ideal for surface mount applications up to 11 feet, and you can choose from 1,600, 2,400, 3,000, or 4,000 watt capacities. Features include a brushed stainless trim, a narrow profile, and a T-slot for flexible mounting options. Complete your patio, terrace, or outdoor dining area with a world-class heater from Infratech. Our experts can help you choose the right heaters for your space, so you can enjoy it all year long!